This is a review of a tea that I received for my birthday in 2015. I won’t be doing too much digging into the costs of the gifts that I’ve received. For Mint Oolong, I genuinely couldn’t even find the product on the company’s website. The presentation of Mint Oolong is really nice. It comes in a clean, clear glass jar that comes with a glass stopper. The jar holds 50g of tea, the label has information in both Chinese and English – and there’s even a nutritional label in English and French on the bottom of the jar. The design is really nice, and I really appreciate how pretty it looks (the glass stopper even has some nice design elements to it to keep it interesting). The fact that it is clear glass makes it not the most ideal tea storage container, but as long as I keep it in a dark place I’m okay with it because it has a great air tight seal to it. The tea itself smells delightful. 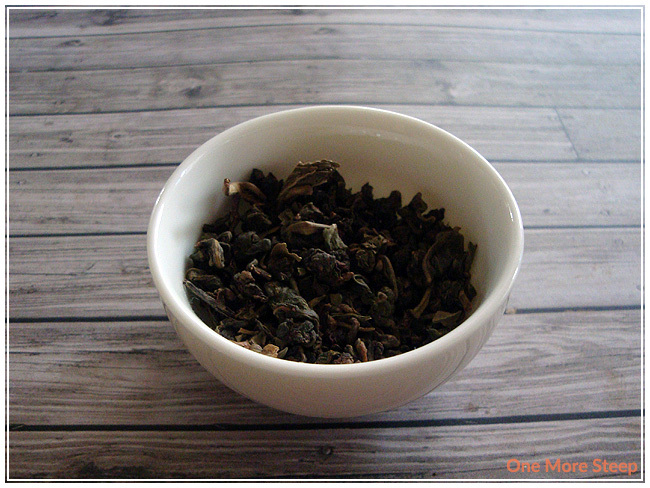 Very minty, and you can see the mint leaves in it, but it isn’t overwhelming the natural fragrance of the oolong. It’s quite a refreshing fragrance though, as a lot of minty things often are. The tea itself is quite fragrant, the stopper on the glass jar is quite snug to help keep air from getting in with the tea, which is a great feature since it helps to prolong the shelf life of the tea. The tea is very simple with two ingredients: oolong and mint. 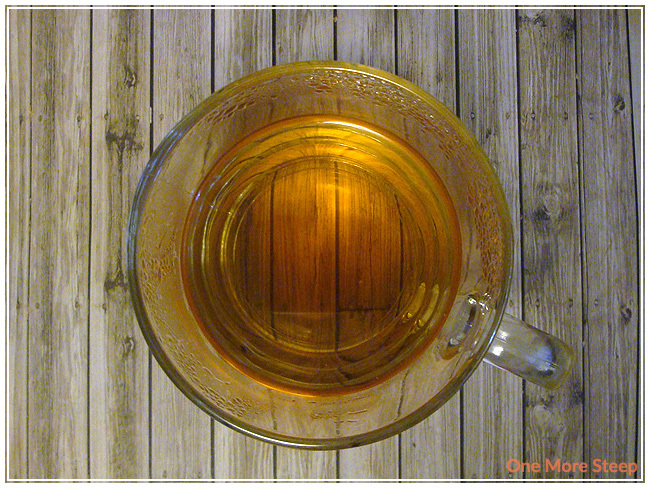 3pm Oolong Tea recommends steeping in boiling water for 3 to 5 minutes. I steeped for about 4 minutes. Mint Oolong steeps to a golden yellow colour, it smells more of the oolong base than it does of the mint leaves. The tea itself is pleasant and enjoyable. Steeping for about 4 minutes yielded a nice cup of tea that is smooth with no bitter notes at all. I found that the mint wasn’t as pronounced in the taste, although there is a hint of it at the end of each sip. The oolong plays the starring role in the tea, as it should given that it is an oolong tea. It’s very enjoyable, and tastes great hot. I allowed the second half of the cup to cool down and it’s really enjoyable as a cold tea as well (I didn’t have it concentrated enough to try it with ice). Mint Oolong does amazingly well with one more steep. The flavour of the oolong is still very much present, the mint plays less into the overall flavour and it continued to dissipate with each subsequent steeping. I found that the oolong did well for about four steeps altogether and the smoothness of the oolong got more enjoyable with each cup. 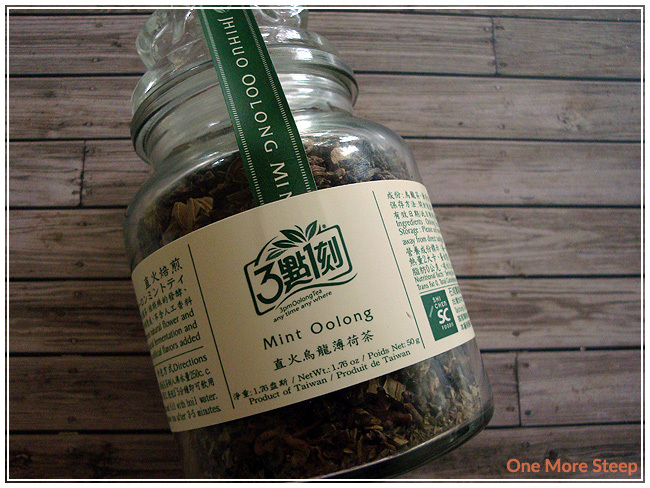 I liked 3pm Oolong Tea’s Mint Oolong. I love how well this tea does with resteeping, it really showcases the quality of the tea when it can be resteeped and still taste really great. I really wish that the enticing mint that I could smell in the dry leaf was more present in the tea with the oolong flavour because it didn’t really do much for me. I felt it was a bit of a let down that the mint didn’t have more a presence in the overall tea flavour, but the smoothness and the pleasantness of the oolong made up for the fact that the mint didn’t have a bigger role in the flavour profile.